The Pacific Island nation of Kiribati has been affected by climate change. A new United Nations report underscores the vital contribution of the social sciences to survival in the face of climate change, and stresses that human behaviour must be at the heart of efforts to tackle the challenges related to the natural environment. The 2013 World Social Science Report takes stock of the “unprecedented and staggering environmental challenges” facing society and their potentially devastating consequences on the well-being of people worldwide, according to a news release issued by the UN Educational, Scientific and Cultural Organization (UNESCO). “Global environmental change impacts everything for everyone on this planet: life support systems, livelihoods, ways of life, actions and interactions,” said the agency, which published the report along with the International Social Science Council (ISSC) and the Organisation for Economic Cooperation and Development (OECD). It added that problems encountered by individuals and communities struggling with social, economic and political crises, persistent poverty, increasing inequalities and social discontent are already exacerbated by environmental change. The 600-page report, which will be launched on Friday at UNESCO Headquarters in Paris, features articles by more than 150 leading experts from all over the world and represents the full gamut of social science subjects: anthropology, economics, development studies, geography, political science, psychology, and sociology. The issues presented in the report highlight the need to draw on the social sciences to bring about the economic and behavioural changes required to achieve sustainability. The report urges a new approach to social science that is bold enough to reframe and reinterpret global environmental change as a fundamentally social process; better in terms of incorporating social science insights into problem-solving; and bigger in terms of the need for more social scientists to address the challenges of global environmental change. The new approach should also be different by changing the way the social sciences view and practice science to help meet current complex interdisciplinary challenges, UNESCO added. 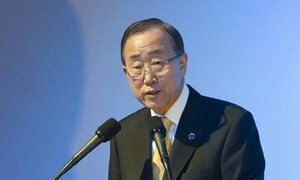 From climate change to public health, science and technology can help countries forge a sustainable future, Secretary-General Ban Ki-moon stressed today, marking the start of the International Week of Science and Peace.